London-based artist Nicolas Deshayes has had a recent string of successful exhibitions, commissions and residencies both nationally and internationally, gathering a reputation for combining industrial production methods with elements of human error. He reminds us of the conflict between our desire for a pristine, polished existence and our imperfect, uncontrollable bodies. Most recently he was the Tate St Ives artist-in-residence in 2014, creating new work for their current group exhibition, Images Moving Out Onto Space, where his work features alongside some of 20th-century giants including Barbara Hepworth and Dan Flavin. Deshayes will produce an entirely new body of commissioned work for this solo exhibition at Glasgow Sculpture Studios. He will present a series of sculptures inspired by radiators, distorting their coils, bulges and folds so they take on a more human quality. The sculptures will be plumbed into the heating system at GSS, allowing heat to travel between them. 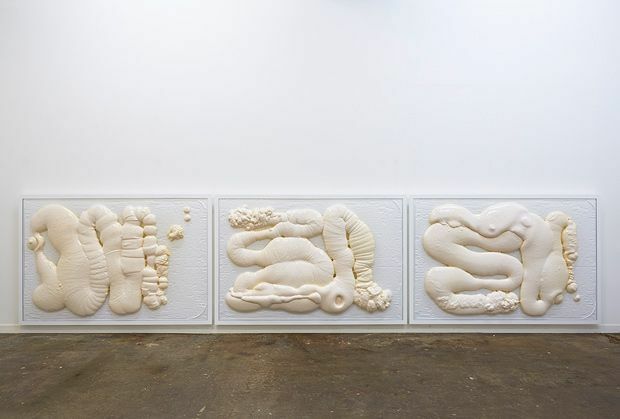 He has referred to this installation as ‘an anatomy for the space’, connecting his individual sculptures together with the gallery’s internal systems, much like the interconnected organs of the human body. Glasgow Sculpture Studios, Sat 26 Sep–Sat 12 Dec, free. The largest exhibition in Scotland to date by this French artist.